I’ve had this book sitting on my shelves for nigh on a decade. Maybe more. It was a birthday gift from my friend Eric, from back when he was my roommate Eric. I know that doesn’t mean anything to you, but I just felt Death whispering in my ear. I picked this one because it has a time machine in it, and I thought that last week’s would have a time machine in it and it didn’t, so, like, I just wanted to read something with a time machine in it. Tempus interruptus, or something. This one violates a few of my usual rules, but I think it’s justified. For one, it’s pretty new. Swartzwelder released this book in 2003. Also, it’s self-published. I didn’t know that when I started reading. I thought it was perhaps just a very small publishing house that couldn’t afford, you know, anything. I avoid reviewing the self-pub market because it would feel a little too much like punching down, and that’s not something I want to do. I know it’s a fine line, but a fella’s got to have principles. This book is a little different, though, since it was written by a Somebody. 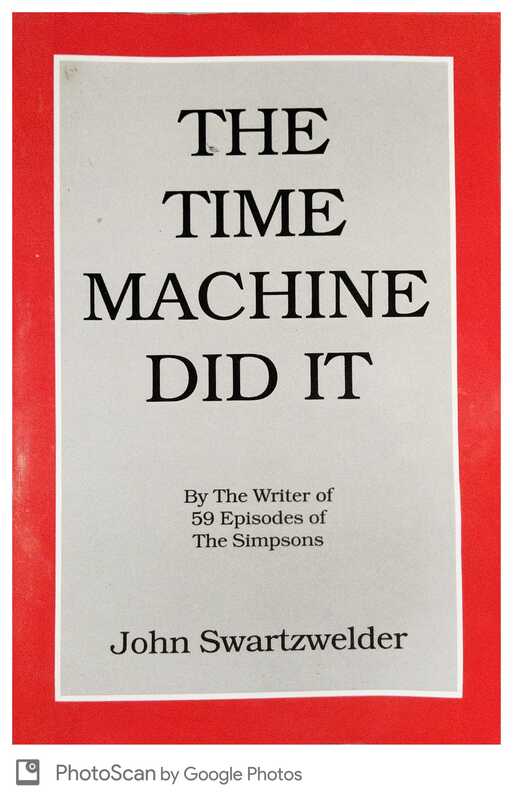 Swartzwelder retired from The Simpsons in 2003 and has since self-published a book a year, beginning with this one. I’m told that most of the other books are follow-ups to The Time Machine Did It, so I’ll probably have to find them. Swartzwelder is also famously reclusive and averse to any kind of press. I suppose that might explain why he chose to self-pub all of his books? This one was certainly good enough to get traditionally published, at least after some basic editing. I just suppose he didn’t want to deal with all of the ancillary stuff like book tours, book signings, media appearances, and all of the other self-promotion things. What makes this frustrating is that this book was good. Very good. Readable and hilarious. It was chock full of so many great one-liners that I could hardly take it. The plot was zany and bananas but I didn’t have any trouble following it. Everything worked on the same sort of dream logic that you might find in a classic Warner Brothers cartoon. Despite me saying it was cartoon-like, I want to make it clear that this book never once came across as a Simpsons episode with the serial numbers filed off. This was a thing entirely of its own. Sure, maybe once or twice I read a line that I could imagine Homer or someone saying, but with a book so full of great lines, that kind of thing would be inevitable. Let’s get into some nitty-gritty. Our hero is Frank Burly. His real name is Edward R. Torgeson, Jr., but he changed it because that’s not a very good name for a detective. Right off the bat we get a good feeling for the book and the character we’re dealing with: He wanted a name that invoked burliness, so he changed his name to Burly. Frank is as dumb as they get. Unlike most of the books I read with dumb protagonists, Frank was intentionally dumb. In fact, he’s well aware of how dumb he is. He comments on it. He owns it. He’s also utterly hapless. Nothing good ever happens to him. Again, this is established by the very opening of the book, which begins with Frank getting punched in the gut several times. We soon learn that this is because detective work wasn’t going very well, so he hired himself out as a bodyguard by a spoiled rich kid. Sure enough, someone started to mess with the spoiled rich kid, so he stepped in. It turned out that the other guy was a bodyguard hired by another spoiled rich kid, and the two spoiled rich kids were just bored and decided to hire some bodyguards and watch them fight. At this point I’m starting to like this book and think I know what it’s going to be all about, but I’m also starting to get a little dismayed. This book needed a copy-editor. It’s hard for me to say that, since the idiosyncrasies of spelling and grammar eventually seemed to add to the charm, but at first I wasn’t thinking that. All I was thinking was that certain words were being capitalized that didn’t need it, that commas weren’t happening in places where they should and vice versa, and that there were a lot of sentences that were either run-ons, fragments, or somehow both. Of these, the sentence structure is the most excusable. It comes across as an attempt to imitate the sort of hard-boiled, noir detective that Burly would love to be. All the rest of it is fine, too, if you assume that this book is being written by Frank Burly himself. And you know what? I’m gonna run with that. Burly is approached by a man named Thomas Dewey Mandible The Third. Mandible has a problem. His entire family fortune has vanished overnight, and he has no idea how. One night he went to bed in his mansion, and the next morning he woke up in the gutter. He tasks Burly with figuring out what happened, and with recovering a golden figurine shaped like the statue of Lady Justice. Burly figures that the guy is crazy, but takes the job anyway. The book then goes into a rapid-fire series of vignettes wherein Frank gets beaten up, nearly killed, arrested, beaten some more, locked up, captured, insulted, and beaten some more again. It seems that a lot of people are very intent on him not finding out what he’s looking to find out. All is revealed when he gets locked up with a fellow named Professor Groggins who, as it turns out, has invented a time machine. It’s shaped like a briefcase. Criminals took it from him and then locked him up and forced him to make them more inventions. He hasn’t succeeded on any of those. Still, the time machine works, and the criminals are going willy-nilly with it, robbing history blind. It was around here when everything about the book really clicked inside my head and I knew exactly what I was reading. At first I was trying to put it together in some kind of realistic-but-humorous way that just wasn’t working. When I realized that I was reading a cartoon, it all fell together. This book was zany. The main problem with time travel, we learn, is that the criminals using it are so careless. It’s not necessarily that they’re careless with history, although they are, it’s that they’re careless with the time machine itself. A criminal will use it to travel to the past, rob it blind, come back, and then chuck the machine into the back of the nearest moving vehicle since they don’t need it anymore. This makes it easy for Burly to get hold of it once he gets free. Burly is too dumb to figure out how to use it (although he points out to the reader that they’d be too dumb to use it too, although they’re handsome, damned handsome). As a result he ends up creating a bunch of time paradoxes that result in there being hundreds of Frank Burlys walking around. He decides to go back a few minutes in time to stop himself from doing that and then overshoots a bit, winding up in 1941. Frank spends a good bit of the book trapped in 1941. He’s trapped because he forgot to turn on the time machine’s emergency brake, so it went back to the present after a few minutes. The bits in 1941 are some of my favorites. Burly tries so hard to make the time period work for him, but he just fails over and over again. At one point, for instance, he manages to re-create the scripts to several major motion pictures, line for line, from memory. He tries to sell them to Hollywood, who tells him that they’re terrible. He gets mad because he knows they’re right. Burly gets back home after he steals the time machine from another time traveler that he happens to see. This other time traveler is also stealing the golden Justice statue that Burly was tasked to find earlier, so that’s convenient too. Burly gets back to 2003 and talks to Mandible again, who gives him the full story about how his grandfather was elected District Attorney and was also a very wealthy man and a great philanthropist which was why—before the time travel happened—there were museums and hospitals and libraries named after him that aren’t there any more. Mandible, Sr. made his fortune by taking bribes from the mob, specifically the part of the mob that took contracts for buildings and then made very bad ones and ran off with the surplus money, AKA regular capitalism HAHA OH SNAP. The time period was even later referred to as the Golden Age of Criminal Architecture. Mandible later felt bad about his actions, but was the sort of person who could never throw a document away, so he took all of his papers that referred to bribes he’d taken and had them origami’d into a statue of Justice, which he then had painted gold. In an altered timeline, that statue of Justice was stolen and exposed to the world, so Mandible lost a DA election bid and all his money, and because this book doesn’t even have to try to make sense when it comes to time travel, his descendants still exist and even remember that they once had money. Burly even goes to Professor Groggins at one point and asks him why some people remember the unaltered past and certain things happened the way they did without there being paradoxes and stuff, among other time travel-type questions. In a moment that, if replicated, would improve the text of about a million crappy science fiction books, the professor says he has no idea. He also manages to kill a younger version of himself, marries his own mother, and kills something that was trying to evolve into him. It finally works out, and in the end Professor Groggins is able to fix everything except for a few bits of history that were too broken to take care of, so now we all have to live in the history where Nixon was president instead of Lou Costello’s comedy partner, for example. and I only bring that up because the original quote is so much better. In the end, you should read this book for yourself if you think you’d like it. I do want to state again that this is very much a self-published novel and that it really could have used some copy-editing, so if that sort of thing upsets you, you’ll probably not want to read this one. I think the main reason I’ve waited so long to read this after receiving it is that I cracked it open after getting it as a gift, saw the state of the prose, and politely set it aside. Sorry, Eric. I know you meant well in giving this to me as a birthday present, and I’m glad to report that eventually I did end up liking it. A lot. I want to close out by reporting a phenomenon that I’ve noticed before in my life but was only reminded of it enough to talk about it when I read this book. I can’t think of a better name for this phenomenon than I Could Have Written That. This is very different from such phenomena as I Could Do This, or I Could Do Better Than This, or I Had This Idea Four Years Ago Why Didn’t I Do Anything About It. I Could Have Written That comes around when you’re taking in a piece of media, and a line or a verse or whatever strikes you as so incredibly you that it takes you by surprise. It’s a moment that makes you think that somewhere in these infinitely complex brains that we have, two neurons lined up the same way in two different ones and resulted in a perfect synchronicity of style and content. It might better be described as This Sounds Exactly Like Something I Would Have Said. I had a number of moments like that in this book, which might be why I liked it so much. I can’t think of any examples off the top of my head to reproduce, and even if I could I don’t think it would help anything because this is the single most subjective feeling in the entire world. It’s funny because it’s a feeling of intense connection with another person across time and space, and yet it’s so indescribable, so unrelatable, that it makes you feel alone because there’s absolutely no way you could ever make it clear to another person how you feel. You couldn’t even describe it to the person who made you feel it. On a related note . . . I’ve mentioned in my own blog that I love to read those 100 Greatest Novels books because I know that I won’t read all those classics, but the three page versions are always great, even if the original would probably have bored me to tears. That’s you, too. I would almost always hate the books you review, but I would never miss a review.